“The weather today is not good,” Lela says as we step onto the marshrutka, a tiny Soviet-era shuttle van ubiquitous in post-Soviet nations. As far as I can tell it is a typical October Saturday in Tbilisi. An overcast sky threatens rain, there was a gentle chill in the air, an opaque mist hurdles over the mountains and settles above the hustle and bustle of Rustaveli Avenue. Today, Lela and I are joining a church group on an excursion to the Davit Gareja monastery two hours southeast of Tbilisi on the border of Georgia and Azerbaijan. “Uh. Should I have brought my passport?” I ask. “No. It is not possible to cross the border,” she responds. I picture barbed-wire fences and Azeri guards in watchtowers glaring down at me, their rifles ready for the second my New Balance sneaker crosses the line. Lela reaches over me and wipes the condensation from the window with a napkin. “Now you can see,” she says as the driver powers up the marshrutka. It’s cramped. My legs are freezing. My knees are jammed against the seat in front of me. But I am mesmerized by the changes in the landscape as we travel into the countryside. We pass one-story houses made of stones, cement and wood surrounded by walls of sheet metal that guard courtyards containing grape vines heavy with ripe fruit. Soon they will be fermented into wine and sold roadside along with walnuts and felt shoes. My trance is broken by Nino, the woman who has organized this trip. She stands and addresses the group in Georgian. Fricative and glottal consonants erupt from her mouth like fireworks. Her eyes widen. Her hands wave. She wags her fingers. She laughs. Others laugh with her. I laugh too. I have no idea what she is saying but I’m drawn to the explosive energy of her oration. “She says John the Apostle died when he was 120 years old,” Lela translates. Somehow I feel there is a little more to it than that. A blonde-haired woman points at me and asks Lela a question. “She wants to know if you’d like some whiskey.” It is 10:30am. I am somewhere in the South Caucasus. Whiskey may be the only word we both understand. This could be my only chance to day drink with a bus full of pious Georgian women. “Sure!” I say. She starts to pour the amber liquid into a flimsy plastic cup when the driver hits a pothole. I am propelled two inches into the air. (Sidenote: There are no seatbelts on marshrutki.) She doesn’t flinch, doesn’t spill a drop and hands me the cup with a smile. Soon someone breaks out loaves of chewy Georgian bread, salty Sulguni cheese and wine in plastic bottles. The marshrutka is now a party bus. Everyone shares what they have brought freely and generously. After two weeks eating alone in restaurants and cafes, this impromptu, boozy banquet feels like home. Warmed by carbs and booze, we reach Davit Gareja. The landscape outside my window has changed. Low hills covered in golden-brown brush stretch to the horizon. Desert winds ricochet off the white sky and howl through shallow valleys of rose-red soil. The mountains have retreated behind the clouds, emeralds hidden behind frosted glass. We walk up the muddy driveway to the monastery. A sheet of rock sprouts from the side of the hill at a 45 degree angle. 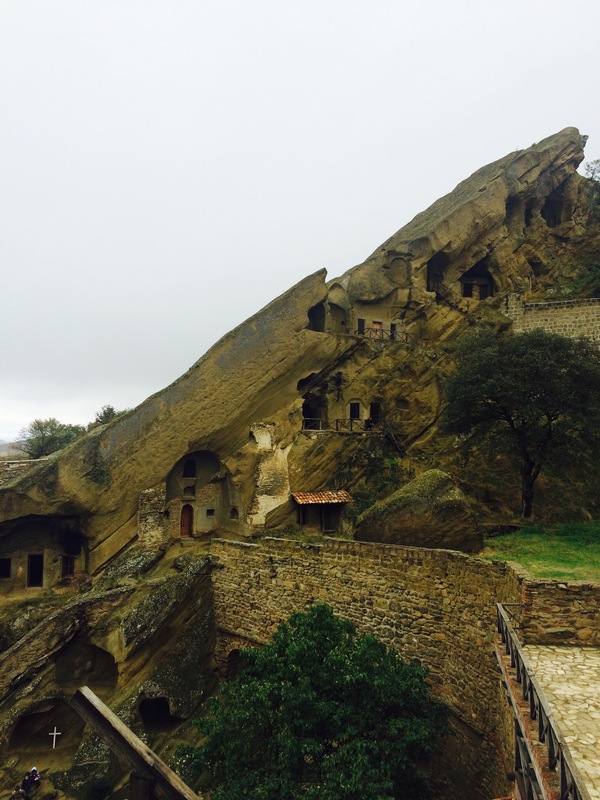 On its side are the caves that have served as monks’ cells since the 6th century when St. Davit Garejeli founded the monastery. The structure casts its shadow on the courtyard and the modest sanctuary below. Though the sacred ground has been sacked, destroyed and defiled by Mongols, Persians and Soviets over the centuries, Georgian monks have returned here time and again to labor and pray. The group begins its trek up the hill. Lela and I fail to keep up with the middle-aged women who move with the agility and confidence of mountain goats in their skirts and heels. The path is steep and seems to have been formed by the footsteps of determined pilgrims alone. Halfway up the hill, the path curves under a short railing. Lela steps over it and proclaims, “This is Azerbaijan.” I follow her, sans visa, and become an international criminal. We rejoin the rest of the group at the top of the hill. A few feet in front of me, the sandy soil drops suddenly into the frothing white mist. “The clouds are hiding the desert,” Lela says apologetically. But I look harder, focus my eyes, and I can just make out the silhouette of the hills of the Azeri desert below. “Don’t fall! You don’t have a visa!” Lela says. From behind us my blonde-haired bartender shouts something. “She says if you fall, your mother won’t able to mourn you. Only the Azeris will!” Uproarious laughter. I remind myself not to repeat this to my mother as I cross back into Georgia just as casually as I’d left it, my half hour as an international outlaw at an end, the only proof being the wet Azeri sand that clings to my sneakers.